Daily Jackpot Slots and Must Drop Jackpot Slots are becoming very popular on the Internet! As the names suggest, they are jackpot slots which must guarantee a jackpot win before it hits a certain amount or before the end of the day! Find here the best online casino where to play Daily Jackpot Slots and Must Drop Jackpot Slots! WHAT ARE DAILY JACKPOT SLOTS? Daily Jackpot Slots are online slots with progressive jackpots which must fall before midnight every day. These kind of slots have an average DAILY payout of over £/€15,000. The highest ever Daily Jackpot win came from a player who staked £/€0.20 and hit a jackpot of £/€53,000! Rainbow Jackpot, Rocket Men, Lucky Little Devil, Five Star, Grand Wheel, Lucky Wizard, 3 Musketeers, Persian Fortune, Lucky Halloween and Gems Gone Wild are the most popular Daily Jackpot slots at time of writing. WHAT ARE MUST DROP JACKPOT SLOTS? 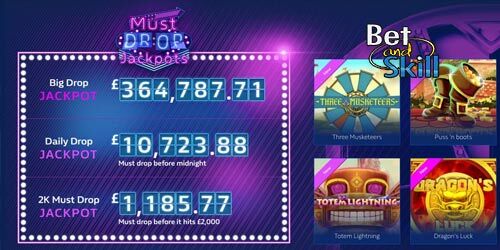 Also known as Must Go Jackpot slots, Must Drop Jackpot Slots are online progressive jackpot slots that simply must drop before it hits a certain amount, eg. £5,000 or £2,000. All jackpots of the Must Drop Jackpots promotion are pooled between the different brands of the same operator. Thus, every big online casino and its sister brands will have their distinct local Must Drop Jackpots promotion. On average, these Jackpots drop 43,4 times a month. More than 1 jackpot per day! And the average drop amount is £2,196. Pyramid Gold, Sphinx Gold or Egyptian Wilds are the most popular Must Drop Jackpot slots. To use on Daily Jackpot Slots and Must Drop Jackpot Slots! Plus, Bet £10 and get £40!! "Daily Jackpot Slots & Must Drop Jackpot Slots: Where To Play"